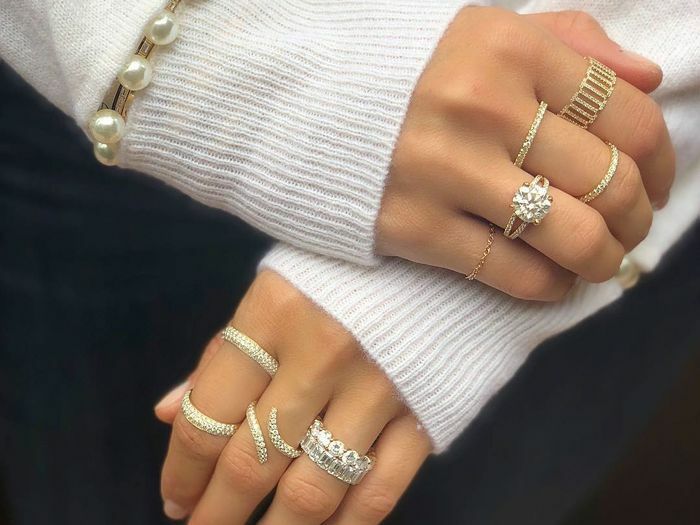 Blame it on our love of shiny metals, beautifully colored crystals, and architectural shapes, but we’re always game to try out a strong jewelry trend. Whether we spot them on the runways of fashion week or on our favorite Instagram stars, these bold styles encourage us to personalize our looks and push the envelope a bit. However, when it comes to the jewelry that we never take off and wear as though it’s a second skin, what we choose often has little to do with what’s of-the-moment and more with what styles will speak to us forever. According to those in the know, there are specific designs that never lose their luster. In order to identify the classic jewelry that’s always in demand, we turned to four major designers to shed light on what their own customers can’t get enough of. This includes Spinelli Kilcollin, Ariel Gordon, and Stephanie Gottlieb, all of their respective eponymous lines, as well as Shelley Sanders of The Last Line. Below are the 11 jewelry trends that they say stand the test of time. Feel free to stay experimental, but we’re thinking the pieces ahead are purchases to make for the sake of the long haul. Up next, see how to buy the 10 handbag brands you’re seeing all over your Instagram feed.